In many ways, I'm fully immersed in new media. I live tweet the Oscars and the Super Bowl. I clean my house while personally-tailored Pandora stations blast through my speakers. If I need to tell a friend I'm running late, I often do it through Facebook mobile, where it's likely to be seen the fastest. A few years ago, we untangled ourselves from the web of contracts, ever-changing prices, and awful programming and got rid of cable service, opting to use Netflix streaming and (much later) Hulu to meet our entertainment needs. I have a Kindle Fire, a smart phone, and a computer, all of which I use to consume news content and smart analysis of issues I personally care about through blogs. New media has made my life easier. When I'm working on a paper for my graduate classes, I take notes in xMind and am able to map out all of the connections between my ideas as well as have quotes that I can drop into the paper all at my finger tips. I keep track of chore lists and calendars through shared apps. I grocery shop with my smart phone open to Zip List. The other day, though, I was driving to pick up my daughter on one of the first beautiful spring days. My windows were half down and I was listening to the oldies radio station. My car is one place where I'm still a Luddite. I have a CD player and the radio, no satellite radio or iPod docks. (The other place is in books. I tried e-books, and I just can't, not for anything substantial.) As I was driving, "American Pie" came on, and I started singing along. Leaving a red light, I glanced in my rear view mirror and saw the woman behind me mouthing the same words. As we stopped at the next intersection, I glanced to my right and saw a woman on that street tapping her hands on top of her car to the beat. There, in that moment, old media connected us in a way that new media could not. We were strangers sharing an experience, and if we'd had access to personal playlists and thousands of carefully-crafted stations, I doubt our music would have synced. The Atlantic recently had a piece about how we should blame live sports for the ridiculous cost of TV packages. The cost of live events is astronomical compared to that of recorded programming, but people continue to pay for it because those live events need to be live: they need to be shared. My husband was traveling for work and went into a bar to grab dinner. When he got there, the bar's TV was tuned to The Walking Dead. There are bars across New York hosting Mad Men watch parties. Even if you prefer to watch these "events" in the privacy of your own home (perhaps, just guessing, because you've got a toddler precariously sleeping upstairs), you can hop on Twitter, type in the right hashtag, and have your experience amplified by the voices of your fellow viewers across the country (or even across the globe). That's an interesting place: live-tweeting a television show. If you, like me, order The Walking Dead through Amazon, you won't get it until the next day. By then, the tweets are old. You can't jump into the conversation and what was a witty or suspenseful comment has become silly or useless in retrospect. This is a time where kairos matters. You have to be there in the moment. You also have to be careful if you still want your own private experience unsullied. The night of The Walking Dead season finale, I wanted to go on Twitter to kill some time. I was there for less than a minute before I realized I had to leave. If I stayed, I was going to find out who died, who lived, and what the basic plot of the show was, all from people sending observational tweets into the universe. This is where old media and new media collide. Without some of the old media, you can get isolated from the crowd on the new. I suspect this will change in the (probably near) future, but right now a fully-immersed cultural experience means keeping a foot in both worlds. I'm looking into getting television service for the first time in years, and being able to experience those events--the sports, the major shows--with the group (even if I'm not in the group) is part of the allure. 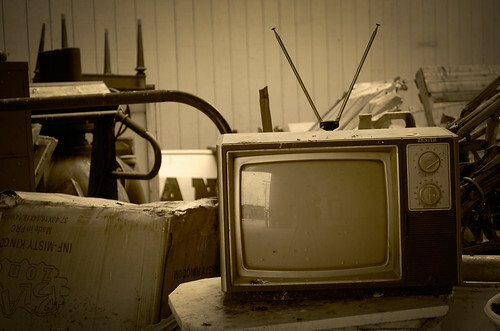 How does new media collide with old media in your life? Are there places where you haven't made the jump? Are there places where you're jumping back?